This interesting surname is a patronymic from "Hare", which is found as "Hir" in Scotland and has three possible origins. Its most likely origin is from the olde English word "hara", a hare, popular as a nickname for a swift runner". The name is also topographical from the Old English word "Haer", meaning stony ground. It is also the Anglicized form of the Gaelic name "O hAichir", descendant of "Aichear", which is a personal name derived from "Aichear" meaning sharp or fierce. Early recording of "Le Hare" date from 13th Century with the first recording of Hare dating from 1379, in the Poll Tax Records of Yorkshire, when a Johannes Hare is mentioned. 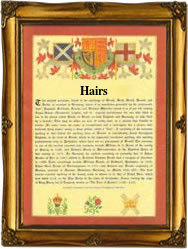 The name is spelt "Hair" in Scotland where both forms of the spelling are prominent in Ayrshire. William Hare was burgess of Edinburgh in 1366. A John Haire was tenant under the Abbey of Kelso (1567). Sir Nicholas Hare (d.1557) was a judge, M.P. for Downton (1529), Norfolk (1539), and Lancaster (1544), and was knighted in 1537. Ralph, son of Ralph and Rebecka Hirs was christened at St. Michaels, Cornhill, London on March 1st 1618, while at St. Botolph Bishopsgate, William Hairs married Frances Birde on November 10th 1629. The first recorded spelling of the family name is shown to be that of Walter le Hare, which was dated 1166, Surrey Pipe Rolls, during the reign of King Henry 11, the "Builder of Churches", 1154-1189. Surnames became necessary when governments introduced personal taxation. In England this was known as Poll Tax. Throughout the centuries, surnames in every country have continued to "develop" often leading to astonishing variants of the original spelling.